What Makes Labyrinth Fish Different? A labyrinth fish is one that has a special organ, known as the labyrinth, which allows the fish to breathe air from the surface of the water. Wait a minute, fish live in water, so why would a fish need an organ to breath air? The answer is in the habitat. Some fish live in locations in which water is, or can become, very low in oxygen. For fish in such habitats, having a labyrinth organ means the difference between survival and death. It is quite common to see a labyrinth fish rise to the top of the tank and gulp air from the surface of the water. The air is forced into the labyrinth organ, to allow the oxygen to be absorbed. Within the labyrinth, cavities are many small maze-like compartments of thin boney plates called lamellae. The lamellae are covered with extremely thin membranes, so thin that oxygen can pass through. Blood within the membranes absorbs the oxygen and carries it throughout the body. If a labyrinth fish finds itself in little or even no water, it can stay alive for quite a while, as long it remains moist. In a pinch, some labyrinth fish are capable of crawling crawl across the land to a different body of water. One labyrinth fish, the climbing perch, can even climb trees. An interesting feature of this organ is that fish are not born with a fully functional labyrinth organ. Instead, the labyrinth organ develops gradually, as the fish matures. Eventually, the labyrinth becomes sufficiently developed to serve its intended purpose. Interestingly enough, once fully mature, most labyrinth fish need to derive some of their oxygen from their labyrinth organ. This is due to the fact that many species do not have sufficient gill function to fully support their oxygen needs. Instead, they must supplement their oxygen intake via the use of the labyrinth. Tests on some species of labyrinth fish have shown that if they are not given access to the surface to gulp air, they will die. Many labyrinth fish are also bubble nest builders. Males of the species will blow bubbles that stick together forming a nest at the surface of the water. The size and thickness of the nest will vary from fish to fish, based on the preferences the male who builds it. Although the purpose of the nest is for spawning, it is not unusual for a male to build an elaborate nest even though a female is not in the tank. Changes in the habitat, the addition of another fish, or changes in the barometric pressure, are all possible triggers for nest building behavior. If a lone male builds a bubble nest, it's generally a sign that he is comfortable with his habitat, so don't worry if your Betta builds a nest. It's a sign that he is happy in his home. In bubble nest building species, it is the male who guards the nest once the eggs are laid. He will also defend and care for the young as they grow. He will quickly retrieve any wayward fry that strays too far away and spits them back into the safety of the nest. Rapidly moving water will make it difficult to build and maintain a bubble nest. For this reason, most labyrinth fish prefer a low current. They also prefer water that is warm, slightly acidic and soft. There are over six dozen species of labyrinth fishes, which are part of the family called Anabantoidei. 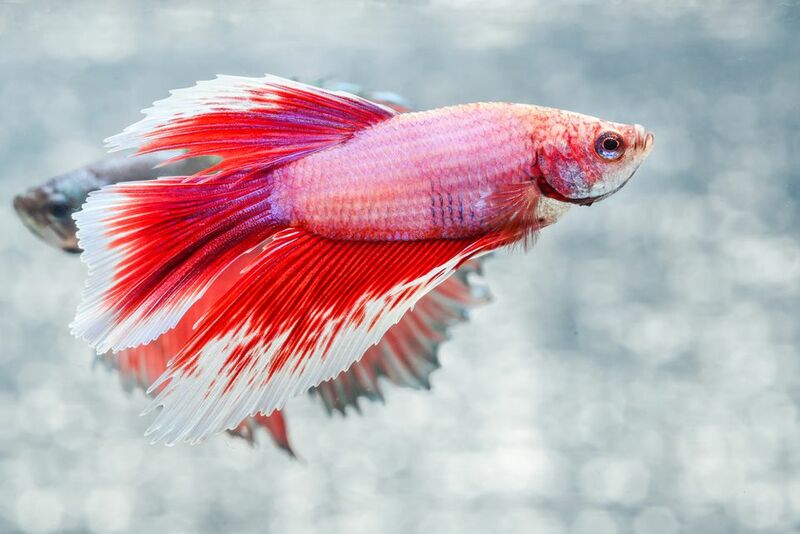 Bettas and Gouramis make up the lion’s share of labyrinth fish species. Labyrinth fish are native to Africa and Southeast Asia, residing in areas where high temperature and low water depth result in low oxygen saturation in the water.